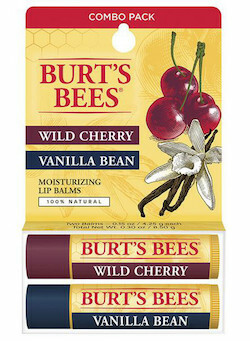 A luxuriously complex and comforting lip balm bursting with all - natural vanilla. Couple that with moisturizing shea butter and soothing vitamin E and you've got a true treat for happy lips. And a balm made with rich cherry oil - cold pressed from cherry seed kernels - this one's sweet, natural flavor with just a hint of tartness will invigorate your senses and pamper your lips. Ingredients: Vanilla Bean: Helianthus annuus (sunflower) seed oil, cocos nucifera (coconut) oil, beeswax (cera alba), flavor (aroma ), ricinus communis (castor) seed oil, lanolin, ammonium glycyrrhizate, butyrospermum parkii (shea) butter, canola oil (huile de colza), glycine soja (soybean) oil, rosmarinus officinalis (rosemary) leaf extract, theobroma cacao (cocoa) seed butter, tocopherol, vanilla planifolia fruit extract, vanilla tahitensis fruit extract. Wild Cherry: Helianthus annuus (sunflower) seed oil, cocos nucifera (coconut) oil, beeswax (cera alba), ricinus communis (castor) seed oil, fragrance (parfum), prunus cerasus (bitter cherry) seed oil, lanolin, ammonium glycyrrhizate, canola oil (huile de colza), glycine soja (soybean) oil, rosmarinus officinalis (rosemary) leaf extract, tocopherol.